Adobe just introduced an update to Lightroom CC (v2015.4) with a new feature called Boundary Warp. Found inside the Panorama merge screen, Boundary Warp intelligently stretches the edges of a merged panorama so you don’t have to crop as much of the final image. How Do I Merge a Panorama? Merging images as a Panorama used to be complicated and involved going into Photoshop. Not anymore…You can do it right from inside Lightroom. First, select the photos you want to merge into a panorama. Next, choose the Photo menu, then click Photo Merge > Panorama. After you decide on your projection (Spherical, Cylindrical, or Perspective), you have the option to just merge the final image and crop it back in Lightroom or you can take advantage of the Auto Crop or new Boundary Warp feature. 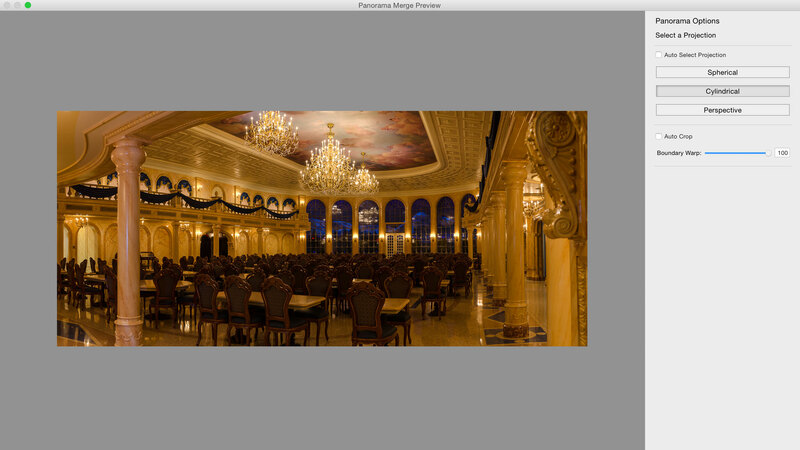 When you click Auto Crop, Lightroom cuts the image to remove all the white edges of your panorama. The Boundary Warp slider will start to stretch the final image and cover up some of the white edges, giving you a larger image. When you put an Auto Cropped image alongside a Boundary Warped image, you can see just how much image you save. In this auditorium example, I chose Perspective projection to keep the stage flat and Auto Crop cut out the edges. When I try to use Boundary Warp, the ceiling warps in a wave thats unappealing for the final image. In this case, Boundary Warp doesn’t work and Auto Crop gives a better result. Give it a try for some of your panoramic photographs. Download the new update today through the Creative Cloud desktop application. New to panoramic photography? Rich Harrington and Levi Sim have a course on Lynda.com about Shooting and Processing Panoramas.